Sooooo, it’s been quite a while since I’ve posted. Yes, I know you are aware of that. However, in my defense, mid-September I packed up and moved out. Yep. Left it all behind. Over the river and through the woods I went. Literally. Then, in October I was promoted. A good career move? Yes indeed! Is it incredibly stressful? YOU BETCHA! I traded in a 500 mile/week commute for 60. Unfortunately, I’m still putting in the same amount of hours. This is still a good thing. No really. It is. So, with the new life and new work comes less time and I’m surprisingly ok with that. I’m spending my time living, laughing, and loving. This is a very good thing. Don’t get me wrong, I still think about the blog. A lot. Every time I embark on a new canning adventure, or cook up something delicious I want to share it with you. Really, I do. But then days turn into weeks, and weeks fade into months; then, the season has passed. And in my draft que those forgotten posts hibernate until their season of plenty returns. Now you know where I’ve been and why the blog is so quiet. It’s not that I’m no longer canning, preserving, and obsessing over food, because I am. TRUST ME! I just lack the required time to write about it. Now that my days are darker and the air is colder I’m hoping to change that. But, I make no promises. We can thank my bestie for giving birth and a much needed 4 day holiday weekend for this very tasty season-appropriate recipe. Friday I headed back over the river and through the woods toting food and a few other necessities, in exchange for cuddles with that sweet little baby boy. She and the hubs had lunch and dinner, I got to feed, rock, and snuggle baby Grey! 1 large sweet potato, peeled and cubed. 1 butternut squash neck, peeled and cubed. In a large pot heat oil over med-high heat and add onion; sauté until crisp-tender, about 4 minutes. Stir in sweet potato, squash, salsa, water, V8, and cinnamon. Heat mixture until boiling. Reduce heat; cover and simmer 20-25 minutes or until potatoes and squash are tender. Stir in corn and beans. In a medium bowl combine cornbread mix, milk, and egg. Spoon on top of vegetable mixture. 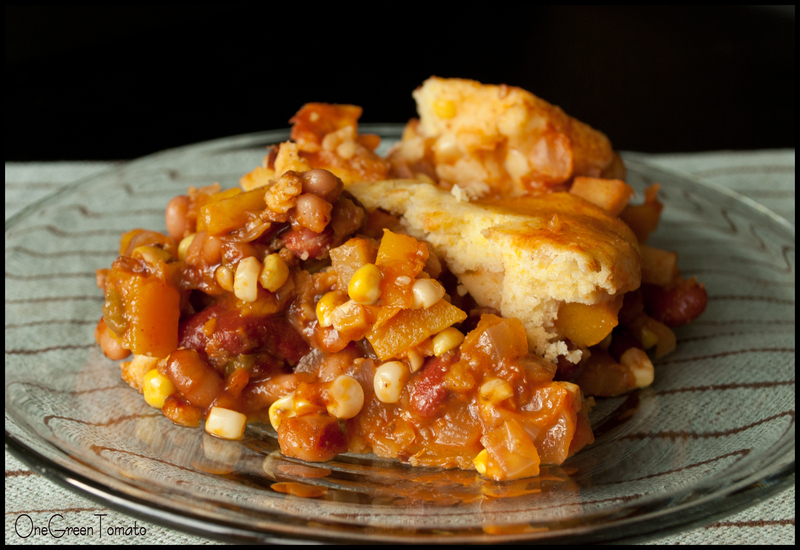 Cover; simmer approximately 20 minutes or until a toothpick inserted into the center of the cornbread comes out clean. As I sit at the cabin watching the white flakes drift gently to the ground, this receipe makes me want to abandon my mug of hot tea and head into the kitchen! This is just what “the doctor ordered” for a snowy day in the woods. Thanks for sharing.